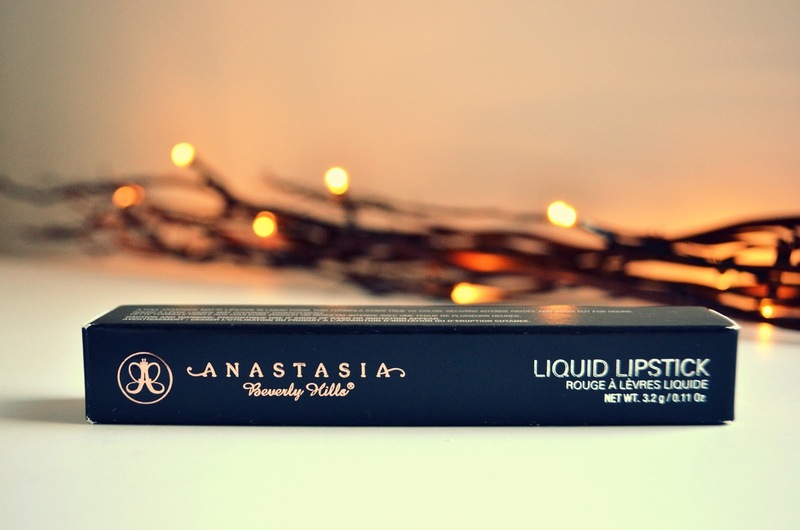 When the Anastasia Beverly Hills Liquid Lipsticks launched this year I was beyond excited. Anastasia Soares has built her well deserved beauty empire and really helped shape the brow world (pun totally intended!). Her contour kits took the beauty world by a storm and so naturally, I had great expectations from the liquid lipsticks. In the states the liquid lipsticks retail at $20 which I think is fairly reasonable. Much to my disappointment they’re not available to buy in the UK and when I had a look on Amazon they were going for £50!! more than double the price they’re retailed at so I gave up on wanting to own them. 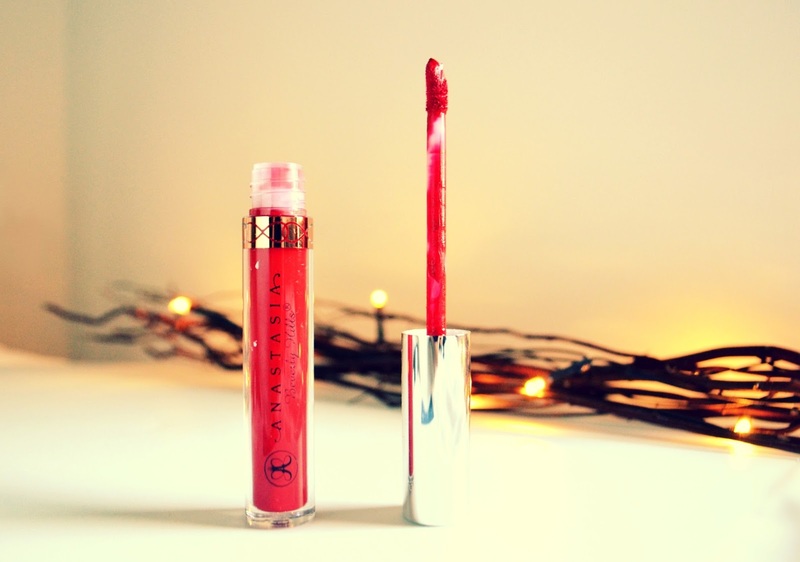 Luckily I had a cousin visiting New York and I was so pleased when she bought me back a present – Anastasia Beverly Hills Liquid Lipstick in ‘American Doll’. The packaging is the standard ABH black box with copper or rose gold writing. The Liquid lipstick comes in a tube that standard lipglosses usually come in. The applicator wand or “brush” as I’ve been calling it is the standard brush you find in lipglosses but the formula however, my goodness, it is dreamy! As soon as I pulled the brush out of the tube you can tell the consistency is quite thick. The liquid lipstick glides on to your lips so easily and the applicator makes it so much easier to follow the shape of my lips. The pigmentation is like no lipstick I’ve tried. It is stunning. It dries very quickly and has a complete matte finish which I really like. My only problem was that after an hour my lips felt very dry. In fact it was so bad that it felt weird on my lips, like I needed to scrub them. I decided to try it again using carmex underneath the liquid lipstick and this did make a difference. I couldn’t feel it on my lips anymore for about an hour but then I felt it.A weird sensation, as though the product was crumbling on my lips. I ran to a mirror to see if it was the case and it wasn’t. The lipstick was intact and the colour looked as vibrant as ever. American Doll is a striking classic red with cool undertones (just like ruby woo) which means it will suit nearly all skin tones. Plus a blue based red lipstick is always good because it makes your teeth look whiter! One of the biggest pros of the liquid lipstick is that it doesn’t come off easily. It doesn’t transfer on to glasses (or cheeks!) but be aware it’s advertised on lots of sites as “permanent” and honestly it’s not completely water and wear proof. If you’re having a drink it will eventually start to come off and unless I top it up I end up with a weird ombre/lip liner effect. What I do like though is that when I do remove it after my night out it has very little staining, which I tend to get with some other brands. This genuinely is a revolutionary product that a lot of other brands are cottoning on to, so I’m expecting liquid lipsticks to hit high street stores in the UK very very soon. I’m not sure how close they will come to the quality of Anastasia Beverly Hills in terms of pigmentation and colour vibrancy but I will genuinely be interested in trying them out. If you can get your hands on one this, I would would definitely recommend it to you.